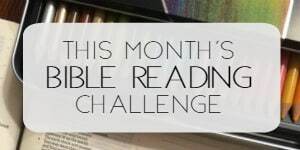 Last fall I attended my church Bible study and we studied Gideon by Priscilla Shirer. Wow- it was a fabulous study and I can’t recommend it highly enough. Have you ever been involved in a study where you knew it was exactly what God had for you at that time? Mmmhmm. I thought you might have. Well, that’s how Gideon was for me. The Lord was telling his forgetful people how to remember His promises. As mama to 7, I can just tell you that sometimes I forget things. And I have to write them down to make sure I don’t forget- because there is just too much that happens in a single day or over a period of time. If you have a visible, tangible reminder of God’s promises right in front of you, then you can more easily remember God’s promises! I know- huge revelation, right? But seriously, I felt the Lord impressing on my heart that I needed to get more Scripture up on the walls of our house. To grace your home with God’s Word is important! My hubby placed the wall decal in our family room last Thursday night. I’m sorry that the photo is a little dark, but the decal looks absolutely wonderful! This particular decal is large and to get it properly applied, it took three of us to follow the instructions. I am so pleased at how it turned out that I’m contemplating several more wall decals, especially with Scripture, for our home. Today I am super excited to be offering a $50 gift certificate from Wise Decor for one blessed winner who is ready to grace your home with God’s Word!! 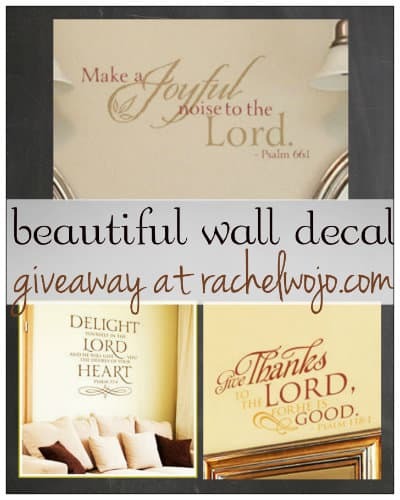 So follow the Rafflecopter for your chance to win, but be sure to take a look at all the wall decals offered by Wise Decor and browse all the many ideas they have for gracing your home with God’s Word. Have a great day and I’ll see you tomorrow with the Whimsical Wednesday blogger linkup! Disclosure: Product provided by company. I was not required to provide a favorable review. All opinions are my own. See full disclosure policy here. I would love to hang up decoratve scripture verses! The many verses hanging up now are written on 3 x 5 index cards and taped up all over the house, especially to the bathroom window…lol! The decals pictured look so much more spiritually inspiring. Thanks Rachel! Forgot to tell you I would choose the “Be still and know that I am God.” That is my phrase for 2014! Would use it to add scripture to this odd section of hallway wall that can be seen from both livingroom and kitchen. I would choose the Fruit of the Spirit – Galatians 5:22-23 Decal. It has become on of my favorite verses. I LOVE the family rules but I have been looking for something for our bedroom. Be Still and Know I’m God is amazing! What a GREAT website! I really love “But my God shall supply all your need according to his riches in glory by Christ Jesus. – Philippians 4:19 ” I had BELIEVE stenciled in my downstairs bathroom not only as a reminder for my family, but for all my guests who happened to use our bathroom 🙂 I too have a lot of Scripture/Inspiring Words hanging throughout our home, but no longer have it stenciled since we moved. Would LOVE to win this! What an awesome idea! I have scripture I will lift up mine eyes unto the hills, from whence cometh my help. This was the subject of the message Sunday. Tks for sharing . Psalm 105:4 – Love this verse and so beautiful on my wall! I love wall decals, but have never found just the right one before – these just might be it. I have a cross stitch I did of chairs on the beach for “Be Still” that hangs in my guest/craft room. love that you did cross stitch of Scripture!! I just moved into a new apartment and have been thinking about putting sayings on the walls. I hadn’t considered scripture though. Thanks for the great idea! I would love the Phillipians 4:8 sticker. 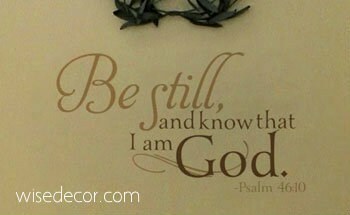 Oh, goodness, I am thinking I would choose the “Be Still and know that I am God” from Psalms. However, I truly like the one with all the scriptures written in chart form. It would be a hard decision….maybe I will need more than one! I love having scripture on my walls and these look amazing! As a new Christian, I’ve been longing to hang Scriptures on my walls. As a single mother, my budget is extremely tight so I’ve been waiting on the Lord to send me some. In the meantime, I have printed out verses in a nice font and put a frame around (which I already had). We recently had our living room and dining room walls repainted, and they are bare. I haven’t even hung up any pictures yet! I would choose 1 Thess. 5:16-18 for our living room. Thanks for the giveaway! I love the house rules 2. It would be an awesome reminder! That’s a wonderful verse too!! LOVE IT! I would love these for my walls. Thanks Rachel for this fun giveaway. I love the idea of putting scripture around the house. I would choose Phil 4:8 for my living room wall. Unfortunately the previous owners thought stucco was were the way to go in the rest of the house so the living room.is pretty much the only place a decal would work. I love them all! I think for now the one I’d pick would be the house rules. I seem to be reminding my kids of these rules on a daily basis! If it was posted in our home where we could read every day I know it would help us all. Have the perfect spot for this. Been looking for something like this to go there too. Rachel! Awesome wall decor! Thank you for sharing this great find. I like the As for me and my house, we will serve the Lord. Would love to win this…so many good sayings and Bible passages! This is so wonderful!! I’m always looking for plaques, prints, and other items for the walls of our home that feature scripture. We even have a key minder that features knock, seek, ask…. They are all so great I think I would need a couple at least! I love the one you posted about I have found THE ONE true love, and the rules of this house would also make my top 10 list! Thank you for sharing this great site! Oops, forgot to say which verse – probably Psalm 66:1 because I pray in the church’s praise band. I love this idea and knowing that we can honor God by putting His word on the walls of our houses. There are so many verses that I love that choosing just one would be hard. Thanks for this giveaway and the reminder that God is everywhere and we can shine His light even in our houses!!! I would love to put some of these on my walls! And I have the perfect spot for one for my daughter’s room! I love the house rules with the scripture and love the name and verse, beautiful!! So many, but I’ll go with Philippians 4:8. Awesome giveaway. Thanks, Rachel. Psalm 139:14 is our Kids Ministry scripture that both my daughters are part of, so that would be awesome for us. I love that wall decal – beautiful! 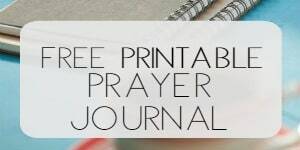 I would love to add scripture to our walls! Oh my these are beautiful, thanks for the chance! I too have wanted to put Scripture on our walls. 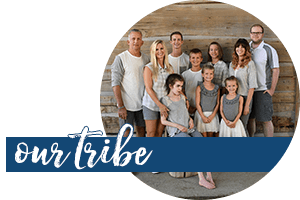 I want the encouragement for our family and for others who come into our home and to bring honor to our Lord. Love Scripture on my walls!! You have a fee that I’d Love to have. Thanks for the opportunity. GOD BLESS!! 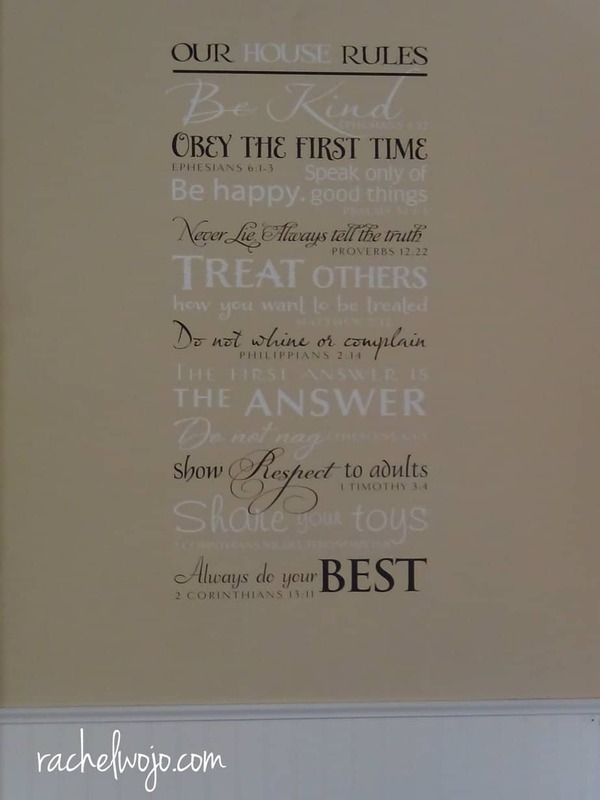 I love wall art like this, and I especially love the idea of scripture wall art. My youngest daughter is getting baptized in 2 weeks, and I think this would make a perfect addition to her bedroom. Love these!! I would love to use more Scripture to decorate our home. Thanks for the chance to win! Oops, forgot to add which one I would pick–probably the marriage one pictured above . 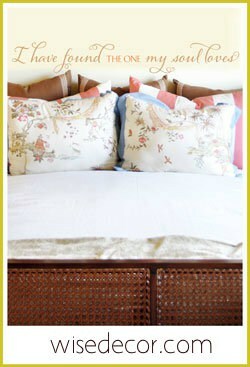 . . “I have found the one my soul loves.” I would love to use that in our bedroom! But I love some of the other choices as well! I like the one quoting Philippians 4:19. Thanks for the giveaway opportunity. We love these decals… What a fun giveaway!